Berges Belt Variators and Variable Speed Drives from Combidrive. Economic speed control has a crucial part to play wherever drive systems are found in machines and installations. 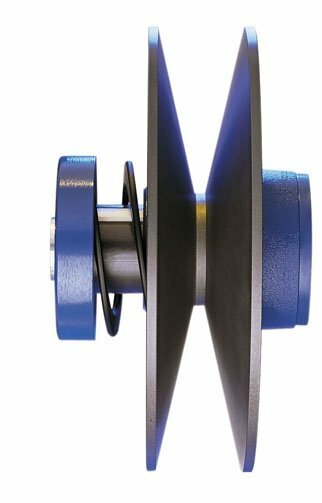 BERGES variable speed pulleys which can be combined with a motor, measuring transducer and computer right up to a complete drive unit meet the designs of design engineers and users for economical and reliable speed control technology in practically all cases. Short space saving symmetrical design. Pressure springs with optimum characteristics for favourable power ratio over the whole speed range. Low mass moment of inertia thanks to the use of pulley sheaves made of highly wear-resistant special aluminium alloy. Alternative designs for wide and standard V-belts. Suitable for U and Z designs. Combidrive has a wealth of experience (since 1975) in the application, selection and maintenance of BERGES variable speed pulleys and enclosed BERGES belt variators up to 150hp. BERGES drives are efficient in terms of frictional (c.90%) and develop increased torque with reduction in speed setting. 1) Extra high torque at low speed. 2) High efficiency (Built in to energy saving applications). 5) Inherently good speed holding. 6) Well prepared to absorb shock loads. 8) Transmission belt, oil and heat resistant and static dissipating. 10) Standard metric motor fitted. BERGES drives are particularly suitable for pumping, mixing and in a wide variety of applications where a robust, efficient, easy to maintain mechanical variable speed drive is appropriate. See further examples below of what we have done since 1975.